Play free downloadable game of Snakes and Ladders, which is originated in India and known as Chutes and Ladders in the US. Select the number of players (2 to 4) and enter their names. Your PC rolls the dice for the players and moves on their colorful pawns in turn. You can climb a ladder or slide like a snake, on the basis of your chance factor. Version 1 is a freeware program which does not have restrictions and it's free so it doesn't cost anything. For security reasons, you should also check out the Ladders & Snakes download at LO4D.com which includes virus and malware tests. Additional screenshots of this application download may be available, too. 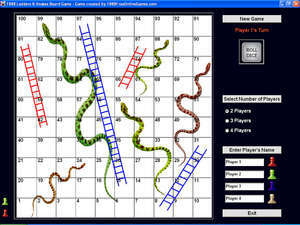 1888 Ladders & Snakes Board Game has a presence on social networks.